Port Moresby: ExxonMobil PNG has expanded its highly successful science ambassador program to include schools in Kiunga in the North Fly District of Western Province. More than 500 grade 8 students in five primary schools experienced the adventures of science with ExxonMobil PNG’s Community Affairs team who taught lessons on rocks and geology. Schools included in the program were Sisimakam, Hongas, Gretutu, St Montfort and Kiunga Town Primary School. The students participated in a fun hands-on experience of touching minerals and rock samples including fossils and had the opportunity to learn how they form into petroleum products over millions of years. 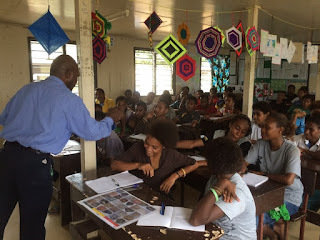 The program was also delivered to grades 8 and 10 students in five schools near the PNG LNG Plant and four schools in the National Capital District in late May. Head of Science Department of Redscar High School near the LNG plant site, Eduardo Ranay said the program has had an impact on its previous grade 10 student participants who have successfully progressed to secondary schools since the program was introduced five years ago. “Science Ambassador Program has changed the way our students see science lessons. It has inspired them to want to learn more and do better in their studies,” he said. “We have seen the impact of the program on students from schools near the LNG Plant area and would like to give the same opportunity to children in the Western Province,’’ said Sisa Kini, ExxonMobil PNG’s community development support and national content manager. “As a science and technology company, we hope the program will inspire and encourage more students to have a passion for science and consider career paths in this area,” Kini explained. Each year ExxonMobil PNG staff volunteer to be science ambassadors and undergo training to be qualified to visit and teach lessons covering geology and the origins of oil and gas using specially prepared science kits. The program is an initiative of ExxonMobil PNG and is aimed at promoting the importance of science, technology, engineering, and math (STEM) to students as well as encouraging them to consider a career option in these fields. The Science Ambassadors Program was originally developed by ExxonMobil in 1990 in Houston, Texas. It was launched in primary schools around Port Moresby in 2013.